Lucy Pescitelli is a virgin pushing 30, working part-time at a funeral home and still living with her mother Marge. A woman so domineering that she forces Lucy to help her commit suicide by following step-by-step instructions as if they were a recipe for deviled eggs. Now, Lucy is on her own for the first time. The social mores of Jane Austen meet the city streets of Rocky Balboa as Lucy must negotiate a world of rigid expectations, entertain a cast of comical characters, and decide whom to marry or not in the still tradition-bound South Philadelphia of the early 1990s. Click here to read Chapter One of When Love Was Clean Underwear in the Summer 2009 Issue of Philadelphia Stories. Mary Mulgrew, What Did You Do? It’s a rainy day and four year old Mary Mulgrew is so very, very bored. Her older brother Jimmy and sister Nancy can’t be bothered with her. But big sister Elizabeth is sound asleep, her thick wavy hair hangs over the arm of the sofa. Mary Mulgrew now knows what to do. 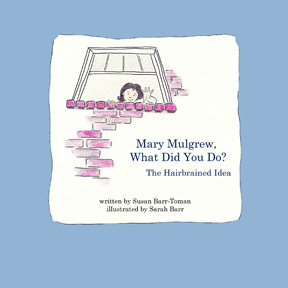 Inspired by their mother’s mischievous tale often told to the author and illustrator at their repeated requests, this picture book describes the naughty details of those hair-brained events that took place long ago in a Philadelphia rowhome.